Doctor Who: The Stuff Of (Myth &) Legends - BATTLEFIELD | Warped Factor - Words in the Key of Geek. Christopher Morley looks at the legend behind the 1989 Seventh Doctor adventure, Battlefield. A Scottish- accented darker Doctor taking the TARDIS into the realm of myth & legend? That's what we'll see when Robot Of Sherwood hits our screens this coming Saturday tea-time. But go back to about the same time on September 6, 1989 & you might just see where Mark Gatiss got his inspiration! For that was the day upon which Battlefield was first broadcast..a sort of pseudo-historical take on the legend of King Arthur, in much the same way Robot Of Sherwood will doubtless play around with the Robin Hood myth. 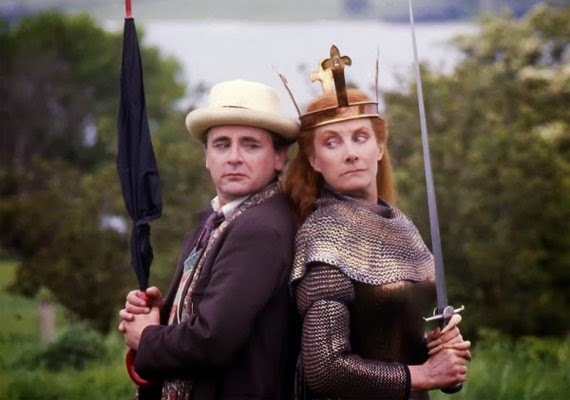 Arriving in the lovely little village of Carbury, the Seventh Doctor & Ace are soon drawn into matters when a crashed ship supposedly containing Arthur's body ( which is still clutching his famed sword, Excalibur) is found in the local lake, Vortigern. Quite apt when you consider that the King is supposed to have claimed the sword from the Lady of the Lake in several accounts. Another has it that he pulled it from a stone in order to prove his royal credentials. The first written accounts of his life appear in Geoffrey of Monmouth's Historia Regum Britanniae ( History Of The Kings Of Britain) which detail everything from his birth to his inheritance of the throne from his father Uther & beyond. It's Geoff who also added in characters like Merlin ( with the Doctor in the role of the wizard). Villainous sorceress Morgaine ( the summoner of the Destroyer) also has some basis in the original tale- in which she's known as Morgan le Fay. Some versions of the legend cast her as Arthur's half- sister ( Arthur's mother Lady Igraine's daughter by a marriage prior to that which resulted in the birth of the King). Le Fey in itself comes from the original French la fee, which simply means ' fairy'- no wonder she's thought of as a supernatural force to be reckoned with once she crosses into Carbury from another dimension with her son Mordred & Arthur's faithful knight Ancelyn. Mordred too has a role in the actual Arthurian narrative- they're rivals after he's earlier betrayed the King, and he'll die at the Battle of Camlann after inflicting a fatal wound on his enemy. He's also Morgaine's son, though his father depends on which version of events you believe. Its either Arthur himself or a king with the rather excellent name of Lot of Orkney! Presumably so called as he ruled Orkney & there was a lot of it in those days? Either way, all three recognise the Doctor as ' Merlin', even though he hasn't the foggiest idea how they've got it into their heads that its him. Given the wibbly-wobbly nature of his own time-line, he knows not whether he has been or will be Merlin. Come to think of it, how could he not be if he's been recognised as such? As a great man once said, ' to the rational mind, nothing is inexplicable, only unexplained'. By which logic we've got some delving to do! Of course all the Arthurian types could be said to be composites created from taking bits of other similar real-life characters, but Merlin is the only one for whom there's evidence of that being true if you choose to believe it. But who's the basis for Merlin? A likely candidate is the Welsh bard Myrddin Wyllt. According to the folklore of the Valleys, he was both a prophet & a madman. A description that equally fits the Doctor himself, wouldn't you say? Its also fitting that what really kicks things off is something entirely in keeping with the spirit of Arthur. Archaeologists led by one Peter Warmsly are excavating the battlefield of the story's title, & the power of a scabbard they've found is troubling local pub landlady Elizabeth Rowlinson. She's visually impaired but a powerful psychic, & ever since the artefact’s been hanging by the fireplace of the Gore Crow Hotel she's known that it can't possibly be of this world. 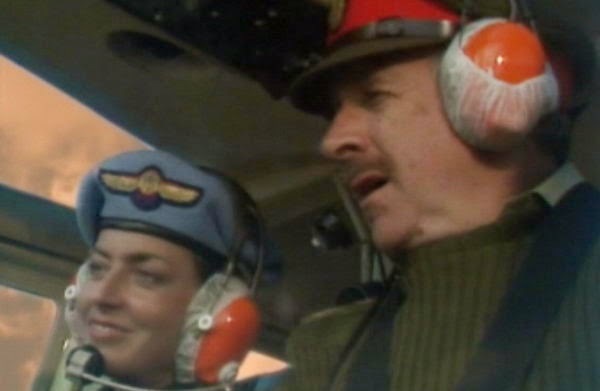 She arrives & promptly shows her power by plucking a helicopter carrying Brigadier Lethbridge-Stewart out of the sky. Warmsly shows the Doctor & Ace around the site of the dig- at which point the man in the pullover finds an inscription with a note in his own handwriting. Its telling him to dig a hole in the ground, which he does with a little help from Ace & her taste for explosives! This leads to a tunnel. Investigating its contents they find a mysterious room- the door to which opens at the Doctor's command. He comes to the conclusion that if he was indeed Merlin, he must have built all this. But the room isn't quite a room at all. Its a spaceship- containing Arthur in a form of suspended animation! Attempting to remove Excalibur from his clutches doesn't seem to end well for Ace, though. Triggering a defence system by which she'll surely drown, its not looking good. Until she emerges from the lake holding the sword! That's the ' Lady in the Lake' ticked off our check-list too at a stroke, then. Yet more magic happens when the Destroyer is summoned to help Morgaine make her grab for the iconic sword. All of which should provide food for thought for any adherents of Clarke's Law- a set of three missives cooked up by the late great Arthur C.Clarke. The one which applies most here is ' any sufficiently enhanced form of technology is indistinguishable from magic'. Not good enough for the Doctor, though, who states that in fact the reverse is closer to the truth while probably secretly being a bit impressed with his lady companion. Whether its technology from Arthur's realm or actual magic, it could be about to cause the universe to go up in smoke, until the Brigadier goes toe to toe with the Destroyer & wins the day. Whether the great King himself was flesh & blood or a fabrication ( a question Robot Of Sherwood may will attempt to answer regarding Hood), it all makes for quite some source material- little wonder Gatiss may have turned to it, in a sense!